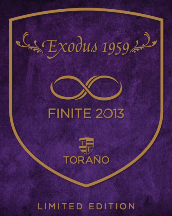 1) Toraño plans to release only 3,000 boxes of a new cigar called Exodus Finite, a Nicaraguan puro that will be available in three sizes: Robusto (4.9 x 52), Toro (6.25 x 52), and BFC (6 x 60). “Finite’s blend combines an all-Nicaraguan filler of Estelí, Condega, and Ometepe tobaccos, a Jalapa binder, and a Habano-seed Jalapa wrapper,” reads a Toraño press release. “Finite is a word which perfectly defines the nature of this new release. Based on the limited availability of the tobaccos we have incorporated in the blend, we knew we would only be able to make around 75,000 cigars.” Look for this cigar starting in August for the suggested retail price of about $8-9. 2) Jamaica was one of the last major Caribbean nations to allow private business like bars and restaurants to decide if they want to allow smoking. No more. Starting on July 15, a country-wide smoking ban will be in place. Businesses will be forced to post “no smoking” signs and tobacco products will be marked with new warning labels. Details about enforcement are forthcoming. 3) Inside the Industry: Press releases announcing new cigars are coming fast and furious with barely two weeks until the IPCPR Trade Show. Drew Estate has acquired Heavenly Cigars, a brand known for its flavored cigars that also produces the more traditional Red Lion blend. 7-20-4 is set to release a new one-size (6 x 52) line called “Spider” that will come in a glass-top humidor box. Room 101 has announced the addition of a new non-limited, regular production, five-size line dubbed the “Room 101 HN” that will feature a Honduran criollo wrapper, Brazilian binder, and filler from Honduras and the Dominican Republic. 4) Around the Blogs: Doc Stogie smokes La Palina Maduro. Stogie Review reviews the Alec Bradley Nica Puro. Nice Tight Ash checks out La Aurora 107 Maduro. Cigar Inspector inspects the Opus X Lost City. 5) Deal of the Week: This “Red, White, and Blue” sampler features six patriotic sticks for just $20. Included are two each of the Graycliff Red, Rocky Patel Vintage 1999 (white), and Don Pepin Garcia Blue. Get yours before Independence Day is here.